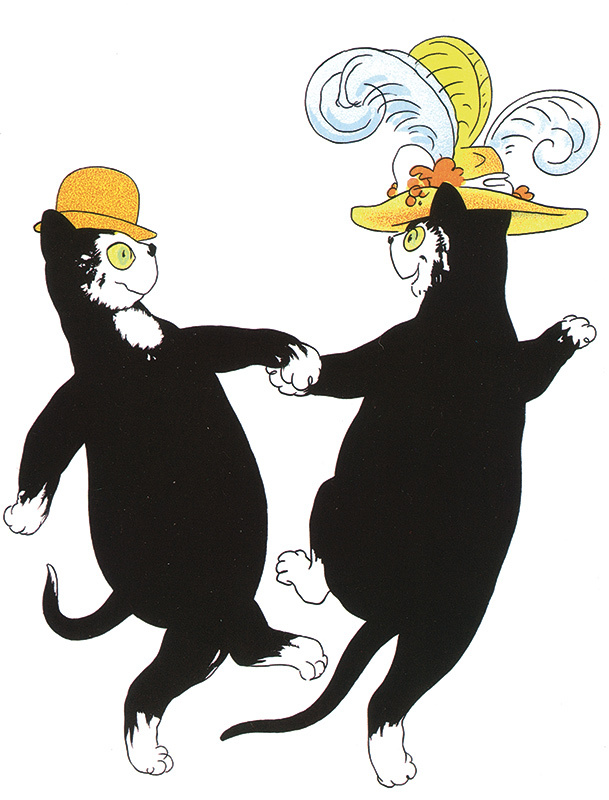 On January 15, I joined in a celebration for the 80th anniversary of the publication of ‘Old Possum’s Book of Practical Cats’ by T.S.Eliot at the British Library. This was the book that Andrew Lloyd Webber turned into ‘Cats’ the musical. I was on with the poet Christopher Reid and the actor Simon Callow. We each read our favourite poem and Christopher and I read one or two of our own poems. It was all great fun, and it’s really interesting to see a real actor at close quarters reading or acting. You can learn so much from the way they ‘play’ their voices like a musical instrument – as Simon did. Anyway, it was great fun. I’m working with the Barbican Centre and some schools on creating ‘boxes’ which will help the children tell stories or write poems about their lives. 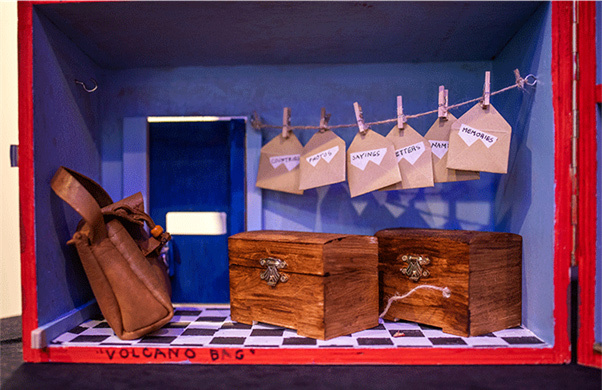 These boxes are divided into ‘rooms’ which each have something in them to represent something from our lives or the lives of our parents or grandparents. I’ve got a poem that goes with each room. I didn’t make my box but the children in the project will make theirs and I’ll get to see them later in the year. 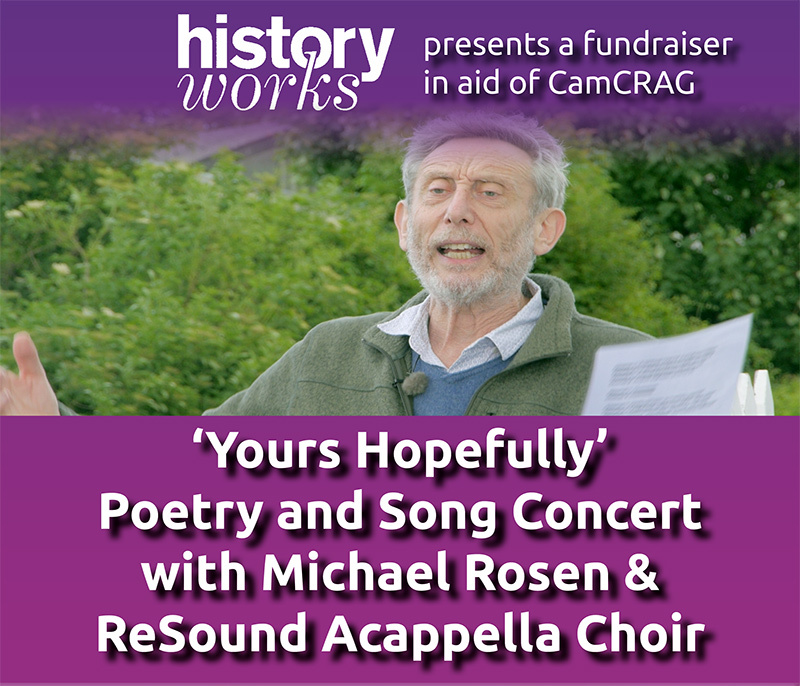 I’ve been working with History Works in Cambridge on a variety of projects – local history and Holocaust Remembrance. You can see some of this on their website. I’ll just add that the project has given me the chance to meet Eva Clarke who was born in Auschwitz. She has a terrifying story to tell of her and her mother’s survival in the last months of the Second World War. This part of the project came to a close with a ceremony of poems, songs and testimony in the University Church. 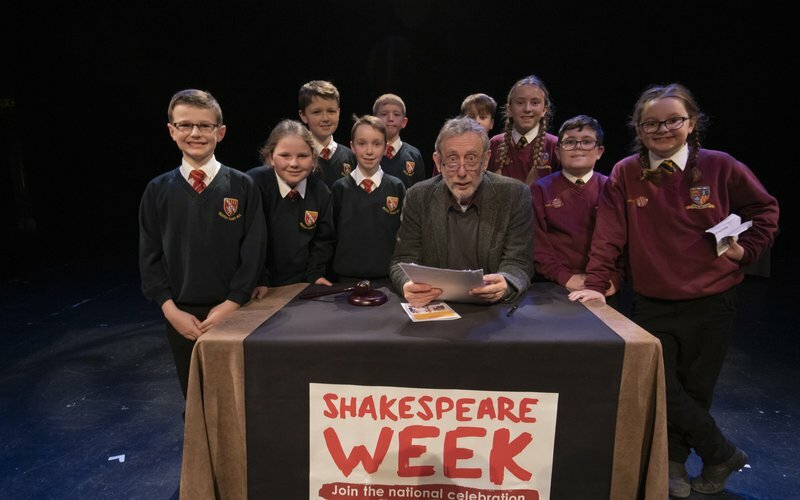 I had a trip to Whitley Bay in Northumberland to do some work with several of the organisations that do work on Shakespeare in primary schools. Two schools took part in a debate on ‘Romeo and Juliet’, discussing whether Romeo and Juliet were good ‘role models’ and whether their parents behaved well or not. I did a short talk on Shakespeare’s language. I did a kind of quiz on the meanings of some of the ‘forgotten’ words in Shakespeare’s plays and I used a piece from ‘Antony and Cleopatra’ to show how he turned a piece of prose into a speech in the play. This year is the 20th year of the Children’s Laureates so there are all sorts of events to celebrate this. There was a party to kick it all off and 9 out of the 10 laureates were there. It’s a great project, run by Booktrust, to put it about out there that children’s books and writers for children play a big part in cultural life in this country. It’s not always an easy message to get over. My best friend at school was called Dave and I used to love going over to his house for ‘Friday nights’. This is a way of celebrating the eve of the sabbath or ‘shabbes benacht’ (Yiddish for it) in Jewish homes. What I liked about it was the way Dave’s father, Morris, used to tell jokes and make up jokes. He and Dave’s mother ran a shoe shop in Wembley Market but he had been a jazz musician. Anyway, sad to say, Morris died aged 103 but the funeral was an amazing event with some of Morris’s songs playing on the speakers at the service and Dave and his brother Howard reading some of Morris’s poems. He was a very clever, funny, kind man. I’ve written about going over for ‘Friday Nights’ in my memoir So They Call You Pisher!. 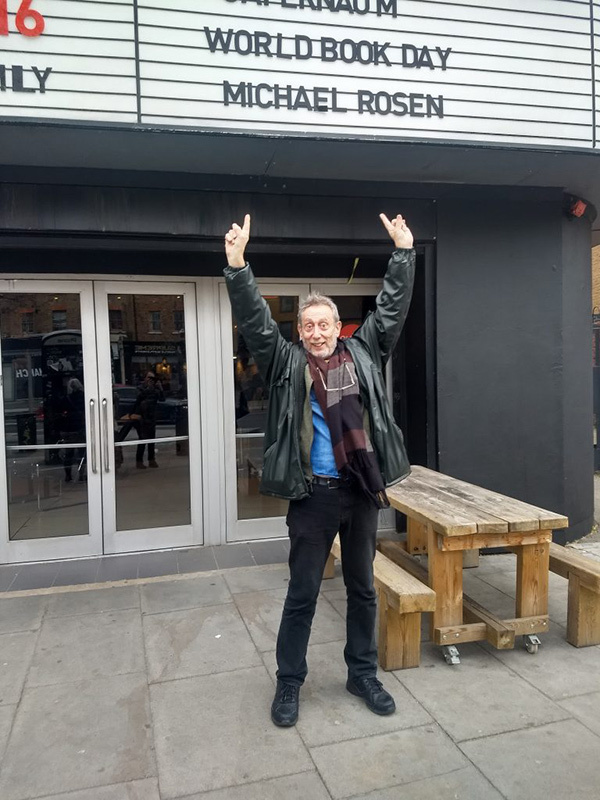 On World Book Day, I did two performances in the Genesis Cinema on the Mile End Road in Tower Hamlets and then did an ‘In Conversation’ event with the playwright and actor Danny Braverman. It was mostly based on that memoir so I got a chance to tell a lot of family stories – which the audience seemed to like. 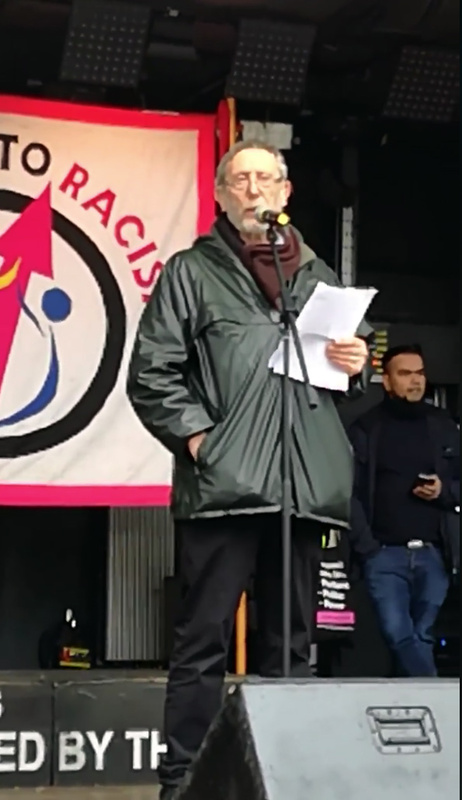 I took part in the Stand up to Racism and Fascism march on March 16th and spoke at the rally at the end. I read one of my poems and met up with people involved in things like the campaign to get justice for the Windrush generation. In late November I did an event in St James’s Church, Muswell Hill, for a great children’s bookshop – Muswell Hill Children’s Bookshop. The vicar told me how a bomb had landed on the church during the Second World War and we stood right where it had landed. For a moment it seemed ages and ages ago and then thinking about it again, it was only a couple of years before I was born! 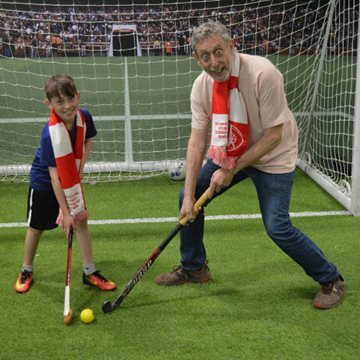 My son and I had a great time at the Emirates on December 2 – perhaps the best time ever! Arsenal beat Spurs 4-2. It was especially amazing because Arsenal were down 1-2 at half-time and to be absolutely, absolutely, absolutely honest, I think Spurs are playing better than us this season. Hah! 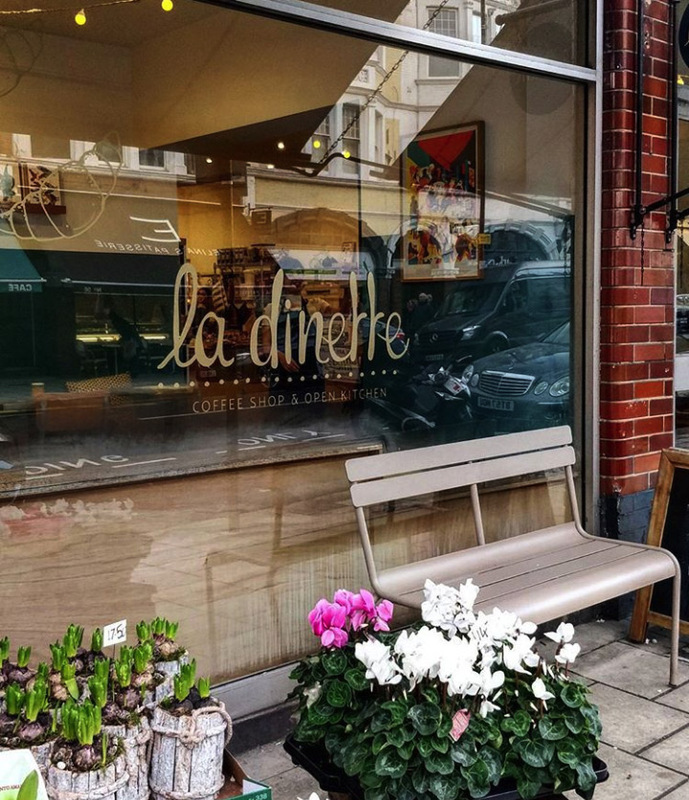 On December 7, I did a little Christmas show in one of our cafes in Muswell Hill, La Dinette. I like doing local shows it somehow connects what I do with people I see in the street. Maybe, it reminds me of how people mostly live in ‘neighbourhoods’ and villages. If you stay anywhere long enough, that’s what happens. Maybe I’m the village children’s poet! On December 12 I visited St Paul’s Church of England School, in Whitehcapel and that had a special link for me. My father lived just a few hundred yards from that school when he was growing up between 1922 and 1939. I like visiting the places where my parents came from and visited. That evening something special happened. My oldest son and his wife had a baby. No photos, we’re all respecting her privacy – if that’s OK! That’s why it was especially amazing to perform at the Old Vic theatre on December 15. My parents used to tell me how they went there in the 1930s and saw Laurence Olivier and John Gielgud acting there. I first went there in the 1950s and I can remember seeing Judi Dench playing Juliet in Romeo and Juliet in 1960. To stand on the same stage as such people really is quite amazing. I was – hah! – stagestruck! On December 18 I did another Livestream for our YouTube channel with a special guest, the wonderful Frank Cottrell Boyce. He is a great guy, writes fantastic books and he’s a big Liverpool supporter so we had lots of banter. He’s got the upper hand at the moment, hasn’t he? Then I interviewed him for a new one of my Writers’ Interviews, third in the series after Malorie Blackman and David Almond. To finish up my public Christmas events, I did two performances in the Elgar Room at the Royal Albert Hall – another great venue, very red and velvety! There were thousands of children there and at first I wondered how they were all going to get in the room, and then I realised that they were showing films like The Snowman in the main auditorium which holds about 6000 people! Oh, they hadn’t come to see me after all. I’ve been out and about (as usual!) talking in schools and to groups of teachers. I’ve been doing this in Chelmsford, Chester, Cambridge, Ashford and Dartford. I met some reading volunteers who are part of an organisation called Beanstalk and I’ve been teaching our MA in Children’s Literature at Goldsmiths, University of London. The trip to Chester was a performance in a theatre – the Storyhouse, which is a lovely, modern theatre. I have to say, I really do like doing performances in theatres when hundreds of children come in from all around. It always feels exciting and full of fun – a real event. Of course this kind of thing takes a huge amount or time, money and organisation. The people who do this for me are the Children’s Bookshow, a fantastic organisation that puts on a whole series of book events all round the country. 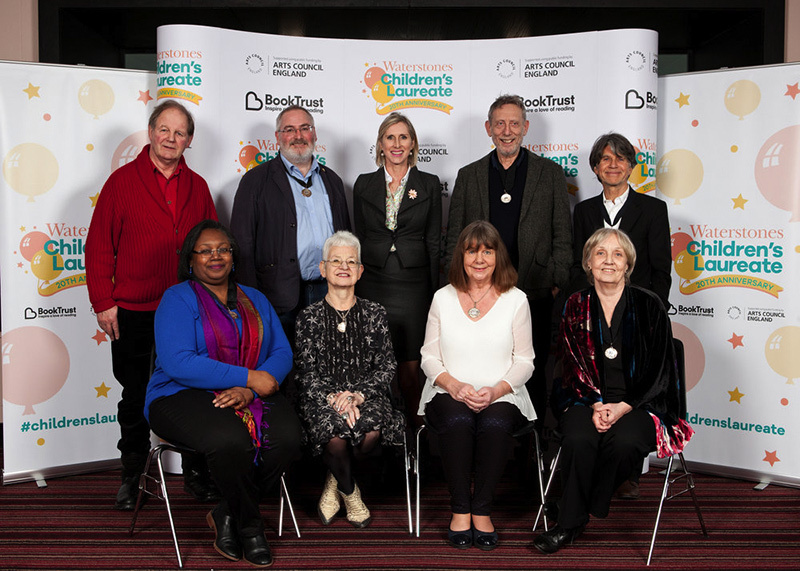 On November 16, I was delighted to attend the Sheffield Children’s Book Award on November 16. I was invited because one of my Uncle Gobb books won the overall prize a few years ago and all the winners of the prize stretching back over 30 years were invited. 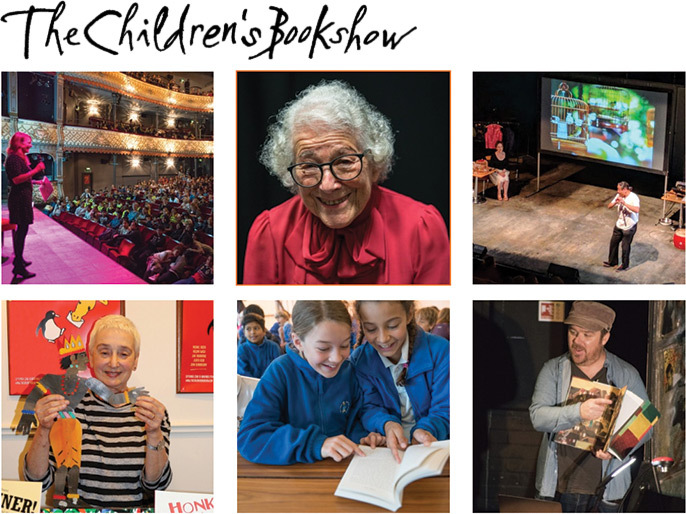 It was held in the Lyceum Theatre, a beautiful old theatre and hundreds of children were there who had read this year’s books that were up for the award. That’s what I really like about this award – the final winners are chosen by thousands of children. I wish every city, town and locality in the country could do this, as it’s a fantastic way for children to read and talk about books. I’ve been to Nottingham for Five Leaves Bookshop and Whitechapel, London for the Idea Store talking about my autobiography So They Call You Pisher! (published by Verso Books). In these talks I tell some of the stories that come from the book. Halfway through, I sometimes worry that if I tell too many and if I tell them too well, people won’t want to read the book! The last part of the book tells the story of how I discovered what had happened to my father’s uncle and aunt in France. He had always said that ‘they were in France at the beginning of the war but they weren’t there by the end’. He never knew but one way or another, partly through luck, partly through digging away in books or online I’ve pieced it together. One result of this is that I’ve discovered that my father’s Uncle Jeschie and his Aunt Rachel were deported from Nice, in southern France, to Auschwitz where they were killed. I found that their names are engraved on a wall that commemorates all the Jews who were deported from France and who died as a result. It’s at the Memorial of the Shoah in Paris. 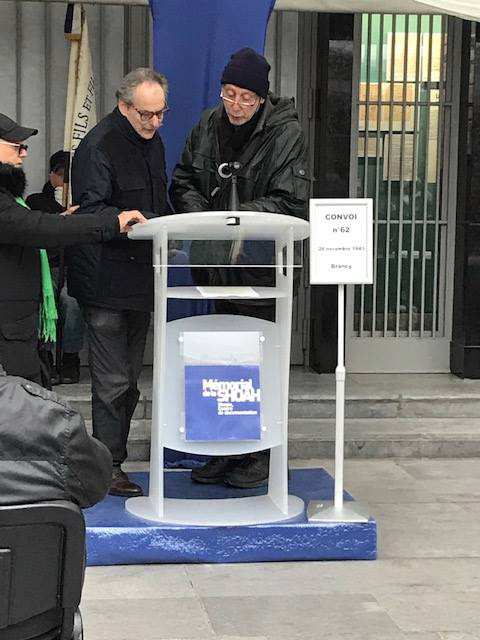 On November 20, my wife and I went over to Paris for a ceremony which commemorated the departure of the train which carried them to Auschwitz (Convoy 62). At the ceremony there were more than a hundred relatives of the other people who were transported on that train and we could, if we wanted to, read out the names of our relatives. It was very cold and people huddled up in their winter clothes, many were quite old themselves and as they spoke, we each said what our relationship was to the person or people who had died. I said, in French, ‘l’oncle de mon père’ and ‘la tante de mon père’ (the uncle and aunt of my father). What was really moving was hearing people say things like ‘maman’ (mum) or ‘papa’ (dad) and they asked us to read out the ages of the children on the train. Some were less than a year old. While we read the names, there were some children playing in a playground nearby and you could hear their voices as they ran about laughing and shouting. I’ve just finished a season of ‘Word of Mouth’ on BBC Radio 4, which means that I’ve been presenting the programme for 20 years! One of the highlights of this last series was an interview I did about what happens to people’s language when they have dementia. Then, the last programme of the series revisited a book by Raymond Williams that came out in the 1970s, called Keywords. Following that, I did a series of 15-minute programmes called ‘Key Words for Our Times’ where a commentator chose a word to talk about and I interviewed them about it. You’ll find all these programmes on BBC iPlayer and podcast. 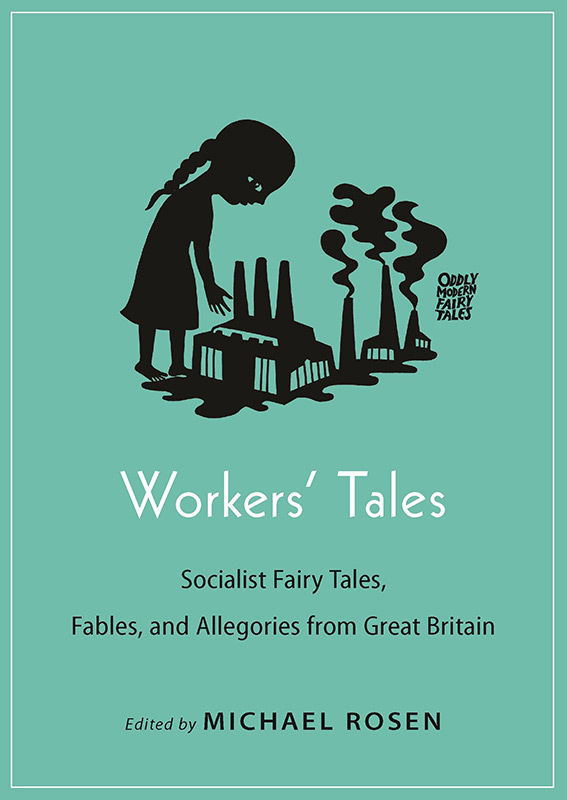 The Guardian published an extract from a book I’ve edited called Workers’ Tales. It’s a story written by one of the people who helped found the Labour Party, Keir Hardie. And the ‘New Statesman’ published an extract from a book that I co-edited with Kimberley Reynolds and Jane Rosen, called Reading and Rebellion. 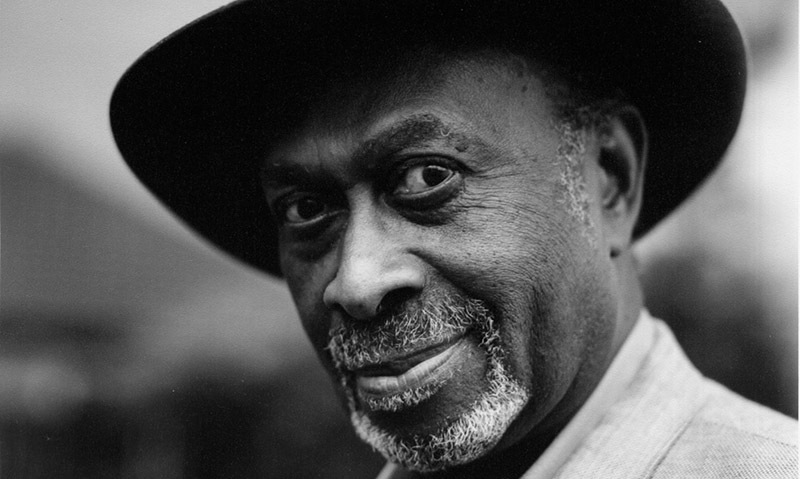 On October 5, Emma-Louise Williams and I went to a conference on the work and life of the late Jamaican-British poet, and short-story writer, James Berry. We knew him well, I had worked with him several times since the 1980s and Emma made a radio programme about him for BBC Radio 4. It was great to hear his voice come over the speakers and hear people talking about him so thoughtfully and affectionately. The book is recently out in paperback, published by Verso Books. Giles Paley-Philips has got a podcast up and running. It’s called ‘Blank’ and he and a colleague interviewed me in a murky basement cafe, Nordic, in London. We had a good time and I think it’ll be ready for listening soon. 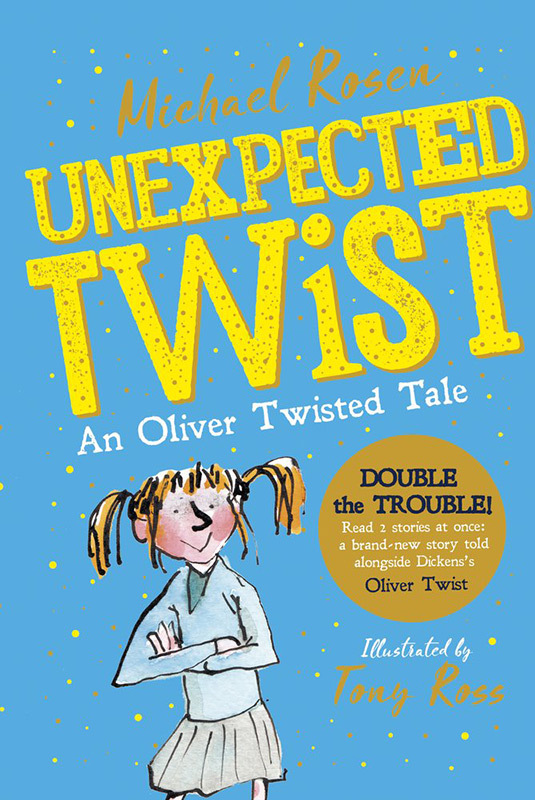 I did a recording of my book ‘Unexpected Twist’ for a company called ‘Bolinda’ who also recorded me doing all the books – bar the latest – that I’ve done for Andersen Press. Here’s Volume 2. You can find them all on Audible. 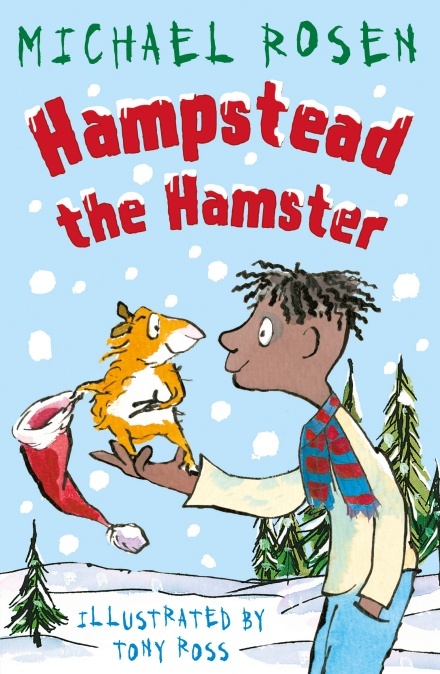 My latest book for Andersen Press is Hampstead the Hamster which has a special Christmas touch to it. On the way back from recording the programme, I went to Cleveland Street in London. 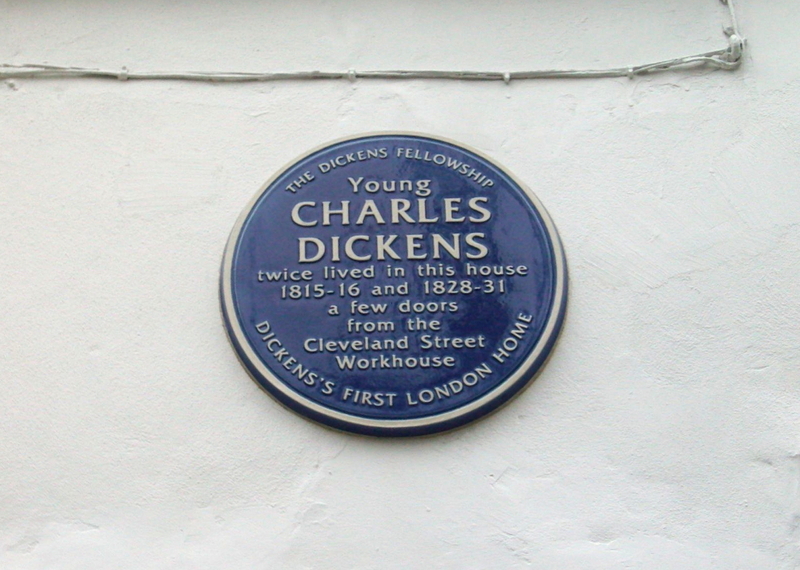 This is very special for anyone interested in Charles Dickens, and in particular, Oliver Twist not only because Dickens lived in Cleveland Street twice in his early life, but because from the house, young Dickens would have been able to see people coming in and out of the Cleveland Workhouse just down the road from his home. Both his home and the Workhouse are still there, so you can get a real flavour of what it was like and there’s every chance that that experience fed into Dickens’s writing about the Workhouse in Oliver Twist. By the way, the old Workhouse building was very nearly knocked down a few years ago, but it was saved, thanks to Dickens enthusiasts. and his birthplace in Portsmouth. And here’s my book Unexpected Twist which tells two stories – a shortened version of Dickens’s Oliver Twist and a brand new story that I’ve written based in part on the Dickens story! 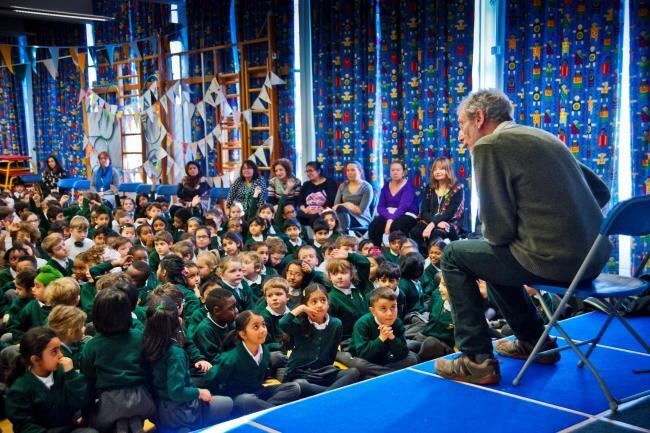 I’ve been busy visiting schools this month doing my performances of my poems and stories. I can see that everyone I meet wants me to do ‘Chocolate Cake’, ‘No Breathing in Class’ and to make the noises I do in ‘Hot Food’ – choop, lip-smack, NICE! It’s very funny when I start to do them because everyone joins in straightaway. It makes me feel like a singer singing their greatest hits! I visited the Pitt-Rivers Museum in Oxford and the Natural History Museum next door. They are amazing places. So many incredible things to see. If you’re ever in Oxford you must go. Don’t laugh – I was looking at old brooms! It’s to do with a radio programme that my wife is making. 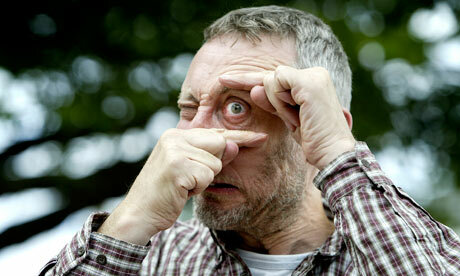 Radio 4 are making a programme about learning poems off by heart. Gyles Brandreth interviewed me for it, so that might be coming out soon. There was a conference in Oxford to do with writers and their education and I spoke about my book So They Call You Pisher! which in some ways is a book about how different kinds of education – school and home – turned me into a writer. It was great to hear Beverley Naidoo speak about her life in South Africa and how she began to write books like Journey to Jo’Burg. I visited the literary festival at Budleigh Salterton and I realised that I had been there before. I didn’t recognise anything because it was when I was 4 years old, 68 years ago! My son and I share season tickets with a friend and it was good to sort that out this month. 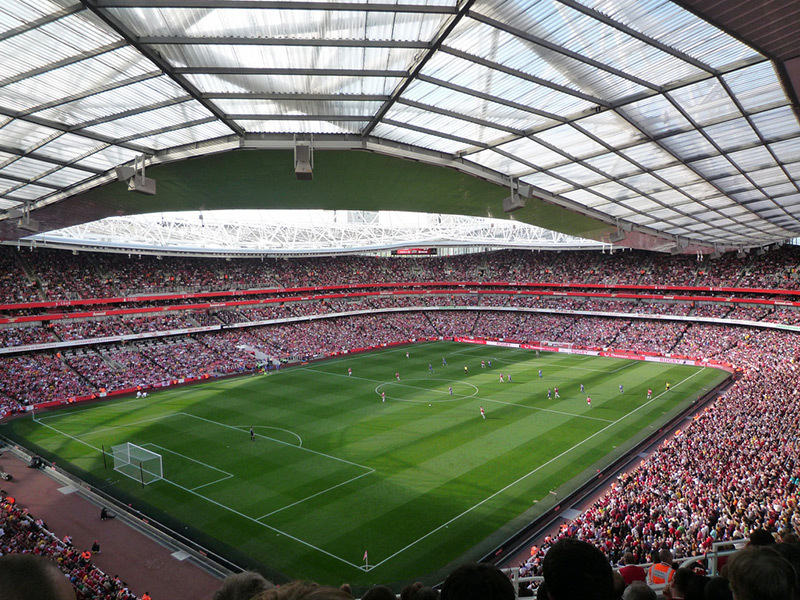 We went to see Arsenal versus Everton. Great goal from Lacazette but we only won because Cech made some incredible saves. 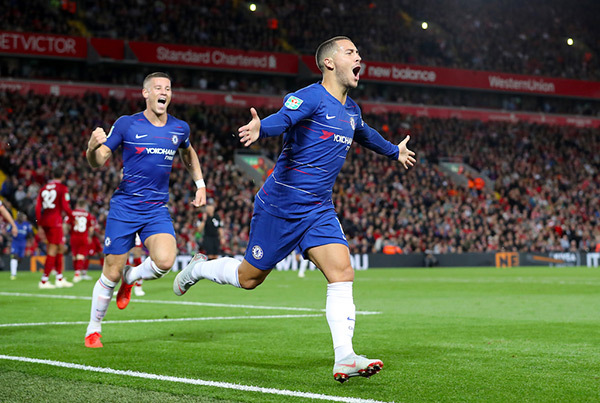 Still, the best football moment of the month had to be Eden Hazard’s incredible goal against Liverpool. Sometimes, in football it doesn’t matter that the player plays for a rival team: a great moment is a great moment. It was just wonderful to watch. Even though we were at home watching it on TV, I stood up and clapped. As if he was there. I hope you’ve all had a great summer. We went to various places, one of them, Ventnor on the Isle of Wight. We had a great time – I found a cafe that sold raspberry sorbet. My two favourite ice creams are raspberry and blackcurrant sorbet, though I can manage dark chocolate, rum and raisin and cookie dough too. 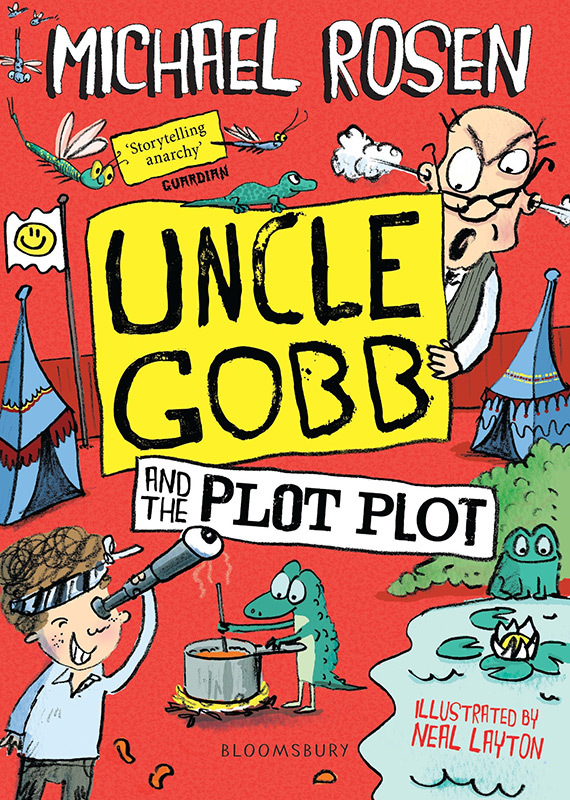 Uncle Gobb and the Plot Plot – this is the third in my Uncle Gobb series. Poor Malcolm has to love with his Uncle who is mad keen to tell Malcolm what to do. And he keeps asking him questions and telling him how he should be better than it is. Once again, Malcolm is plotting on how to get rid of Uncle Gobb. But – meanwhile – Uncle Gobb is plotting on how to get rid of Malcolm. Luckily Malcolm has got his great, great, great friend Crackersnacker to help him. And there’s a girl called Lizard who is helpful too. Unexpected Twist – this is a book based on Oliver Twist by Charles Dickens. Perhaps you know a bit of that Dickens story – about a boy who has no parents and is in the Workhouse. What I’ve done is imagine a story that is a bit like the Oliver Twist story. And this time it’s a girl. In the Dickens book, Oliver gets in with a bad crowd, even though he doesn’t realise it at the time! Can you think how that might happen today? How could someone not know they were getting hooked in to a bad crowd? 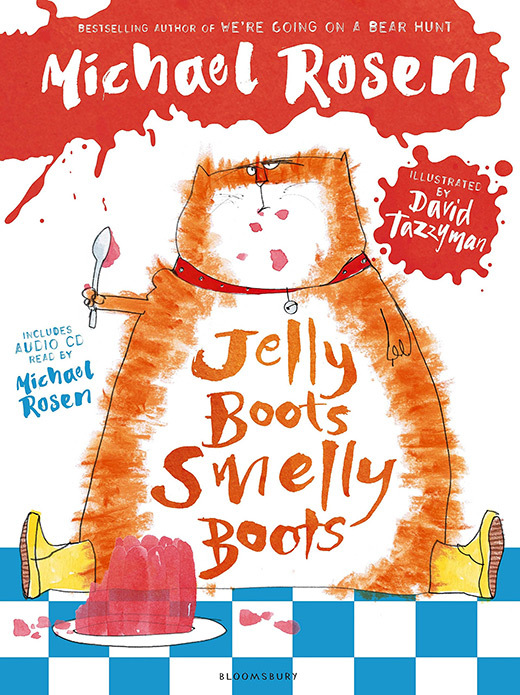 The paperback of my book Jelly Boots, Smelly Boots is coming out too and this has in it some of my favourite poems: a mix of funny, crazy, sad, mysterious and great, great pictures by David Tazzyman. Hope you enjoy it. I’ve been writing some more books too! I’m working on a book to do with how I found out what happened to my father’s uncles during the war. It’s a very sad story but at least I’ve been able to find out and so they are not forgotten – which is how it was when my Dad was alive. He never knew what happened to them. And now I’ve found out. It doesn’t bring them back alive but at least they are remembered properly. I’ve also written what I hope is a funny fairy story…I don’t know yet whether any publisher will want to publish it. That’s what it’s like when you’re a writer. You write something. You hope it’s good. You send it off and you wait to see if a publisher likes it and thinks that they can make it into a book. So, I’m sitting here with my fingers crossed! On June 13 it was great to go to the Social History Society’s annual conference in Keele University. People were giving a whole host of papers on their research on social history of the past and present. 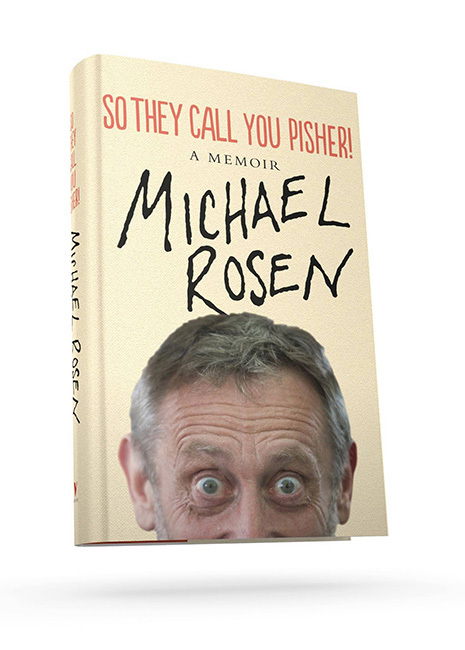 I talked about my memoir So They Call You Pisher! which gives a view of what it was like growing up in the London suburbs in the 1940s, 50s and 60s coming, as I did, from a background of people who came from ‘outside’. My parents were from London’s East End, Jewish in background, and so there was a big contrast for me and my brother, between the world our parents talked about from before the Second World War and the world we grew up in. In the evening of the same day, I went to the Wiener Library in London, which is a remarkable archive of the history of Nazi Germany. 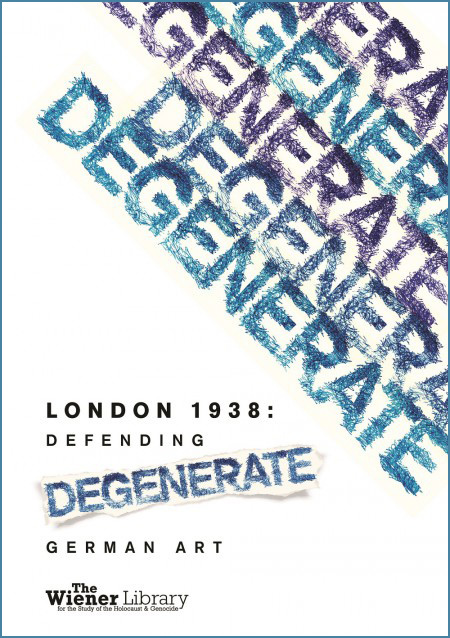 They have regular exhibitions and this one is about what the Nazis called ‘decadent’ art, the art they despised and thought was ‘degenerate’. On June 14, my son and his friend, Ian organised a pub quiz event on behalf of St Joseph’s Hospice in Hackney. Ian’s mother, who I knew well, sadly died in the Hospice but in order to show his gratitude for the way they cared for her they set about raising money for it. Anyway, I was the quiz-master. I don’t have many ambitions left, but one of them was to be a quiz-master! It was fantastic fun, making up the questions, doing them and I met a young celeb: Liam from ‘Bake Off’! He was at the same school as Ian and my son and he agreed to do some cake questions – o yes! – and act with me doing bits of dialogue from famous films. Great fun at the Matchwomen’s Festival which commemorates the wonderful strike by the women who worked at Bryant and May’s matches factory in London’s East End in the 19th century, organised by Louise Raw who’s written a book about it. I talked about So They Call You Pisher! (which talks quite a lot about my parents who came from nearby). It took place at Bow Arts, where Emma-Louise Williams and I organised an exhibition of the East London Group of painters only a few months earlier. 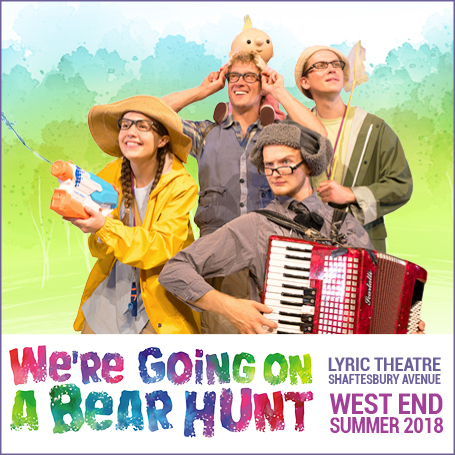 Great fun at the Lyric Theatre, Shaftesbury Avenue, London, where the show, ‘We’re Going on a Bear Hunt’ based on Helen Oxenbury’s and my book, is on. I was asked to come along and do a workshop with the audience. We went on all sorts of other ‘hunts’, the children making up going on a ‘robot hunt’ or a ‘snake hunt’ and the like, and they came up on stage and we made all sorts of funny noises. Great fun to work with such young children who were really brave to come up on stage like that! Live webcast. I did a two and a half hour webcast on our YouTube channel. We had loads of questions, shoutouts, queries and I did various poems. You’ll be able to see it up on our YouTube channel very soon – or it’s up there already! I never know exactly as these things are sorted by my son Joe! Speaking of my YouTube channel, we have released a batch of official T-Shirts. They are available to order now! 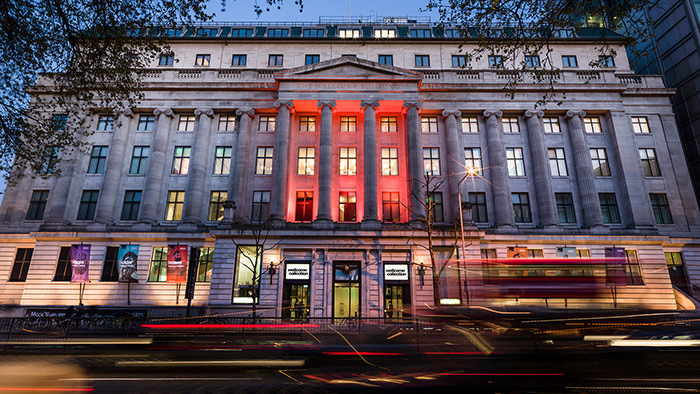 I recorded an appeal for Meningitis Research Foundation, that is broadcast on BBC Radio 4. This will go out in September, so listen out for it! It’s focussing this time on a research project on vaccinating women when they’re expecting a baby as this may well give the babies great immunity to meningitis. 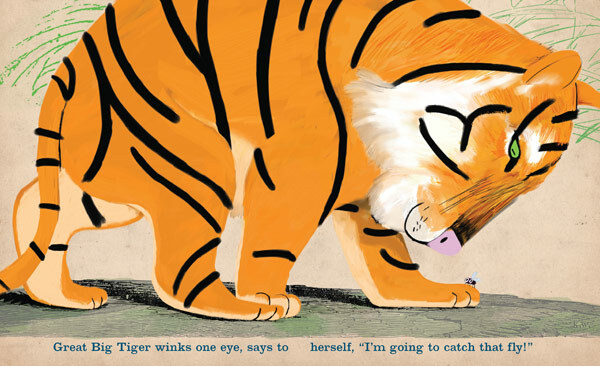 A lovely board book version of ‘A Great Big Cuddle’ comes out on the 2nd August. 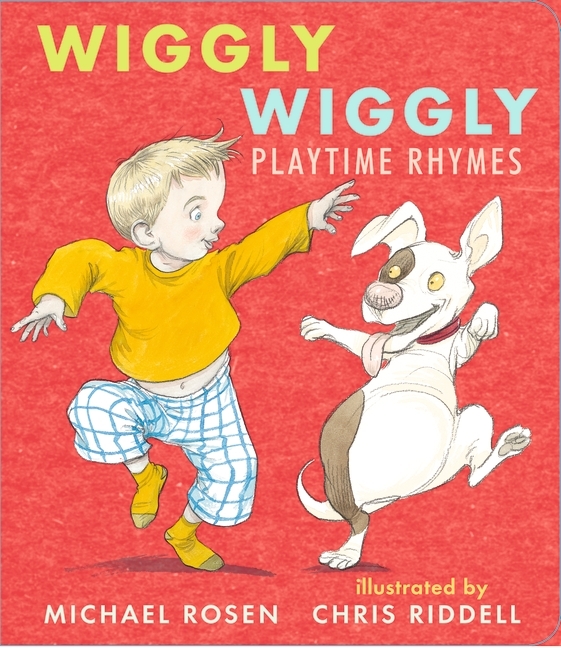 It’s called Wiggly Wiggly and it’s got the most wiggly, funny, rhymes from the book, ideal for the very youngest children to have and pour their gunky food all over and chew the corners. Ah, I remember it well! And to think that my oldest child who used to give his books a really good going over is the one directing me on YouTube! Congratulations to Kevin Waldron who did such wonderful pictures for this book! He won the Children’s Books Ireland prize for illustration. Further Chocolate Cake news: the Polka Theatre did a wonderful musical based on the poem, and I went to see it a couple of times. It’s now on tour around various venues in the country. I think it’ll be back next year playing various venues then. Professor Jack Zipes, one of the world’s great experts on folklore, folk and fairy tales was over in England and we were delighted to host him talking to us at Goldsmiths, University of London. He talked about how fairy tales have a social and political relevance, particularly when they talk about power and haven’t been stripped of this relevance by people trying to ‘civilise’ them. I’ve been reading his latest book, ‘The Sorcerer’s Apprentice’ – a magnificent book, exploring the significance of the master-slave, boss-apprentice, adult-child relationship as shown through the many different versions, (anthologised in the book). Highly recommended. Published by Princeton. I’m working with them on a project which is under wraps at the moment! Here’s a booklet I’ve done to support work that teachers are doing in helping pupils write for fun. It focusses on a technique of using the shape and ‘syntax’ of stories that are already written and imitating them and/or inventing aspects of them. I give an example of doing this using the plot of ‘The Tempest’ in order to write a modern story. On the Road With So They Call You Pisher! 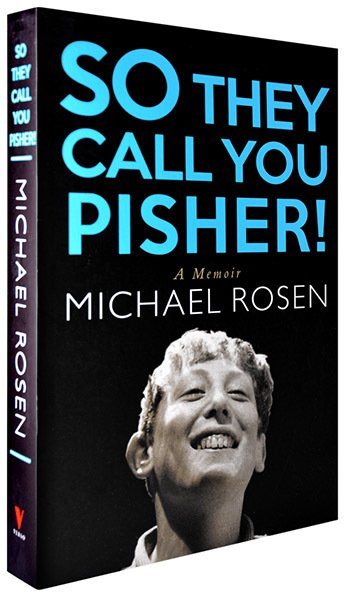 I’ve been talking in quite a few places about my memoir So They Call You Pisher! (Verso Books) and it’s turned into a kind of 45 minute stand-up comedy routine. My parents were in their own way both comedians and so it’s good to get their jokes and ways of going on ‘out there’. I’ve now made a recording of the book and it will come up soon on Audible, iTunes and Amazon. The Polka Theatre has come to the end of its run of Chocolate Cake – a show based on my poem of that name and some other poems. I saw it twice and thought it was wonderful, so full of fun and music and inventive digital work. I’m really glad to say that it’s going on tour this year and will, they hope, return for another tour next year. It was a great honour to give a short speech at the final conference of the National Union of Teachers before they go into one big union the National Education Union. No matter what criticisms I make of government policy on education and though this is sometimes a criticism of what goes on in classrooms, I keep trying to say that this is not a criticism of teachers. I fully understand that teachers have to do what the government, Ofsted and the testing-exam system tells teachers to do. I hope that that is always clear. If it isn’t, then I hope I can make that clear here. It’s always been my aim to support teachers in their professional job of doing their best by children, parents, families and community. I believe that the excessive test and exam system, policed by league tables and enforced conversion, prevents teachers from assessing pupils in ways that can directly help the pupils. It was great to do an evening at the Wanstead Tap in celebration of 40 years of the Newham Bookshop, a fantastic community bookshop that supports community reading in hundreds of different ways. Viv Archer who has managed the shop in all that time is a friend and colleague and it’s always been a delight to do readings of all kinds for the bookshop. Long may it thrive! 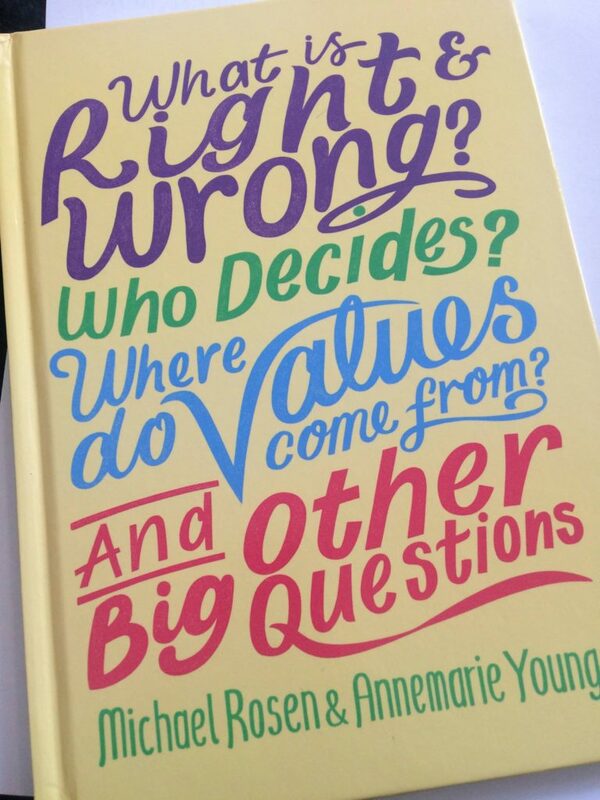 A book I did with Annemarie Young called What is Right & Wrong? published by Wayland has come out. It’s to help anyone reading it how to decide the really big stuff in life and living. I’ve been writing a rhyming picture book for Scholastic. I can’t say much about it yet – top secret! – but it’s about a dog. Well not actually ‘about’ a dog – more, ‘by’ a dog. OK, I realise a dog didn’t write it, but you get what I mean! Anyway, I’m still working on it. I mean, the dog’s still working on it. I’ve done a rehearsal for two huge shows at the Royal Albert Hall on March 11. 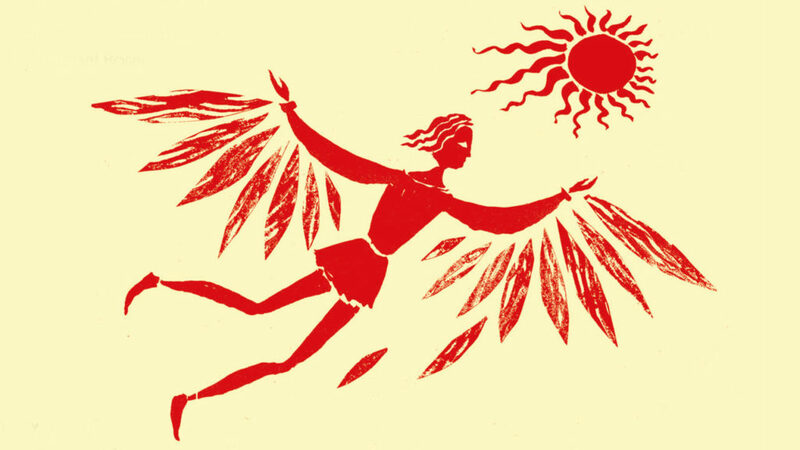 I’ve written the words for some songs based on the Greek Myth, Daedalus and Icarus. The music is written by Will Todd and I’ll be doing the narrating – the spoken bits between the songs. We rehearsed at our home, and the conductor brought his little 2 year old boy with him and he played with our children’s old soft toys and ate houmous! In my memoir, So They Call You Pisher!, I put a photo of my father’s uncle in his army uniform. I thought that he had been in the French Army in the First World War. 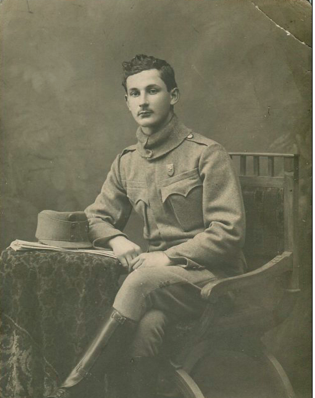 It turns out that he was on the other side: he was in a Polish regiment in the Austro-Hungarian Army. How do I know? Because I posted up the picture on twitter and people tweeted me to tell me. The power of social media, eh? I’ve just heard that BBC Radio 4 have asked me to present five shows about words like ‘post-fact’, ‘fake news’, ‘debt’, ‘doom’ and the like. I’m really looking forward to it. I’ve pretty well finished my Oliver Twist book. It’s hard to explain but really, like Bah! Humbug! it’s 2 books in 1. That’s to say, there’s a cut-down version of Oliver Twist and there’s a brand new story that I’ve written about a girl called Shona, who is in a way a bit like Oliver. She and her classmates are reading Oliver Twist in class, exactly while Shona gets into trouble over the matter of getting a ‘free’ phone! Tony Ross is going to illustrate it and it’ll be out in September or October this year. I’ve also finished a book that goes with the series of books I did with Tony Ross that includes Fluff the Farting Fish and Choosing Crumble, all published by Andersen Press. The latest is called Hampstead the Hamster about a boy who gets a hamster for Christmas…but something is wrong: the hamster is unhappy. Luckily, the boy – Leo – is very good at figuring out what Hampstead wants. Will he be able to cheer him up? Let’s hope so! 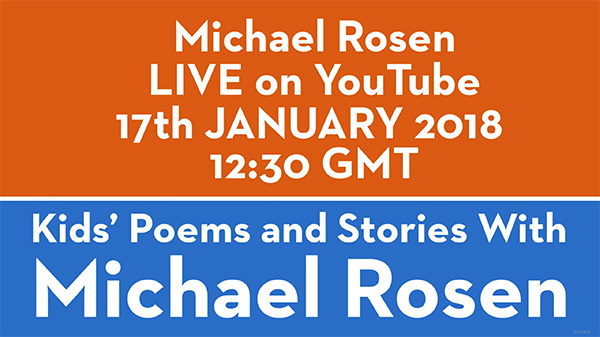 You may have seen on my YouTube Channel, Kids’ Poems and Stories with Michael Rosen, that I did another live web chat. It went very well at the beginning but then we ran into ‘technical problems’ and I started to fade into a fog. It looks a bit like some kind of sci-fi movie. I have to say, it wasn’t what we meant it to turn out like, but – hey – we’re busy learning how to do these things and at least you know it’s for real, and we’re not puppets! 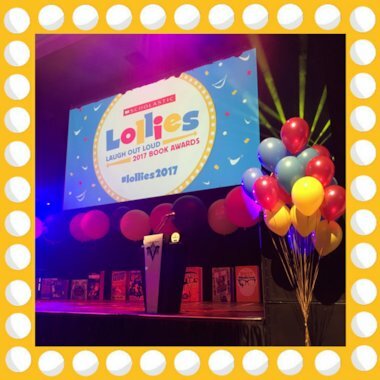 The Lollies award ceremony was amazing with great acts and performances from the Horrible History Show and Alesha Dixon read from her children’s picture book. And then the prizes were announced. If you want to find out what are the funniest books of the year, go to the Lollies website and take your pick! I have a strong connection with this prize because it’s sort of ‘my baby’. I mean, when I was Children’s Laureate, I helped create the Roald Dahl Funny Prize, and the Lollies Award has taken over from it. It’s great to celebrate funny books, don’t you think? As I said, in my last ‘News’ I was going to visit my old school, Pinner Wood, in Harrow, North London. It was amazing to see it. It’s survived falling down into the chalk mines that were found underneath the school. 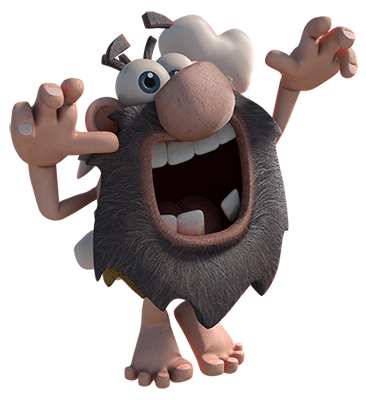 The head told me that they aren’t prehistoric ones – I thought they were! They were dug by a farmer who lived just up the road and thought that he could sell some chalk. One problem: he didn’t fill in the holes and tunnels! So, over a hundred years later, the playground suddenly opened up and there was a great big hole down there. They put a camera on a cable to look and they saw the tunnels. It reminds me a bit of when I was a boy in Pinner we went down an air raid shelter that we found in the Memorial Park. I was very honoured to take part in the Cambridge memorial days for Holocaust Memorial Day. 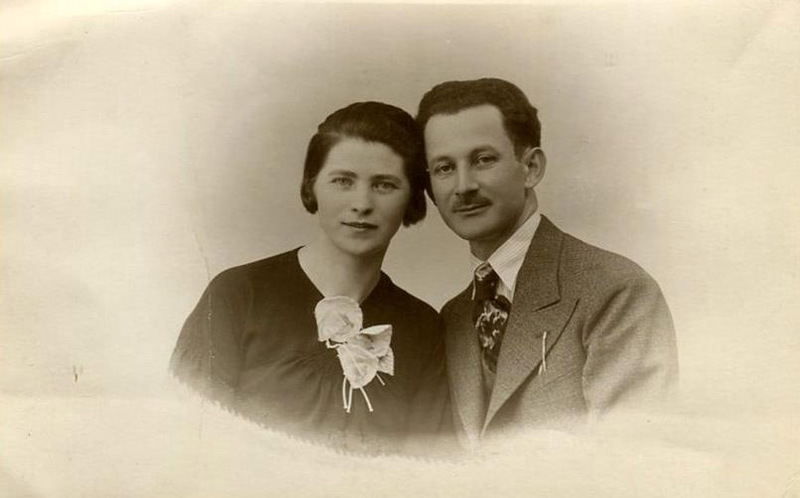 I read some poems about my relatives who died in the Holocaust and school students from several schools – Parkside and Trumpington amongst them – wrote fantastic poems themselves. And then I made some more videos for the YouTube video channel. This time I’ve told some stories about someone I call the ‘Bakerloo Flea Woman’ who comes from a book that I wrote called Nasty. I also made some little videos for the Polka Theatre for the show they are going to put on from March to May based on my poem Chocolate Cake and some other poems too – with music by Barb Jungr. 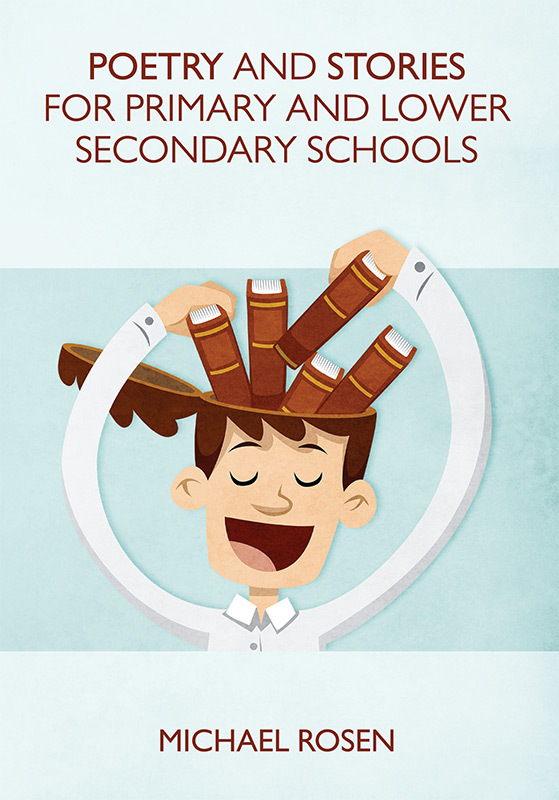 Teachers may be interested in my new booklet: Why Read? 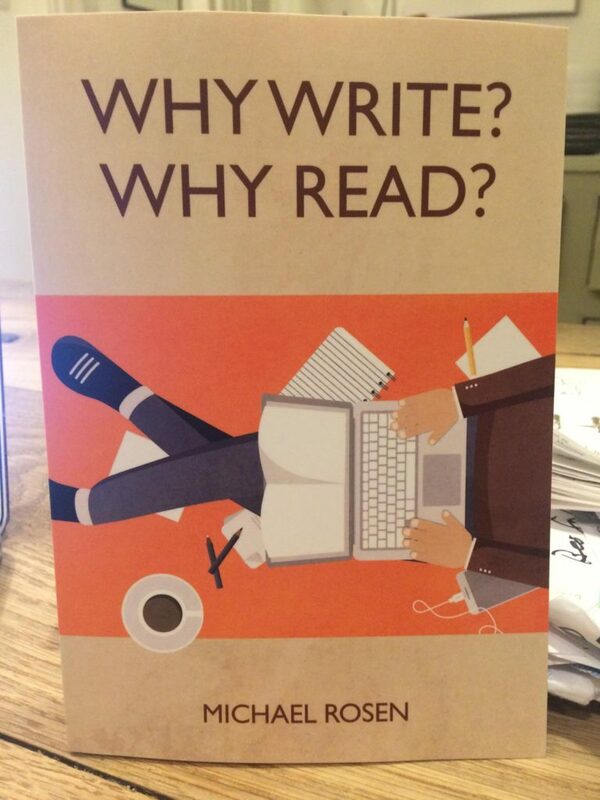 Why Write? It’s a set of articles about reading and writing to inspire you and your pupils with great language work. Some of it comes from my talks with my MA students at Goldsmiths, University of London. Find out more about the book. I’m deep in the middle of writing the follow-up to my book Bah! Humbug! that came out for Christmas. That one is based on A Christmas Carol by Charles Dickens and this new one is based on Oliver Twist – also by Charles Dickens. With Bah! Humbug! 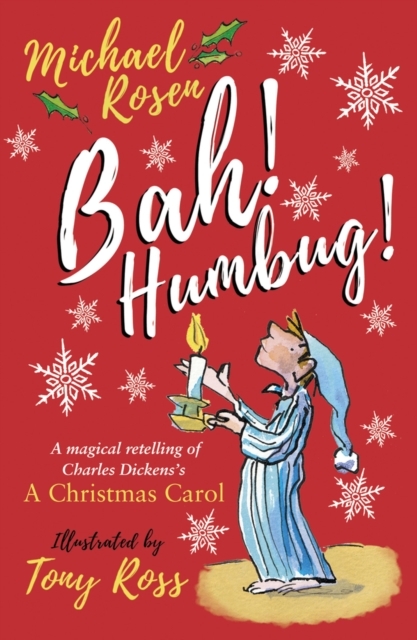 we had the idea of a modern family where some of the people in the family are like the characters in A Christmas Carol so Dad is a bit like Scrooge, the daughter, Eva, is a bit like Tiny Tim and so on… The children in school are putting on a play version of A Christmas Carol. The pictures are by Tony Ross and we both dressed up in Dickensian clothes to go on BBC Breakfast and Newsround to talk about it. 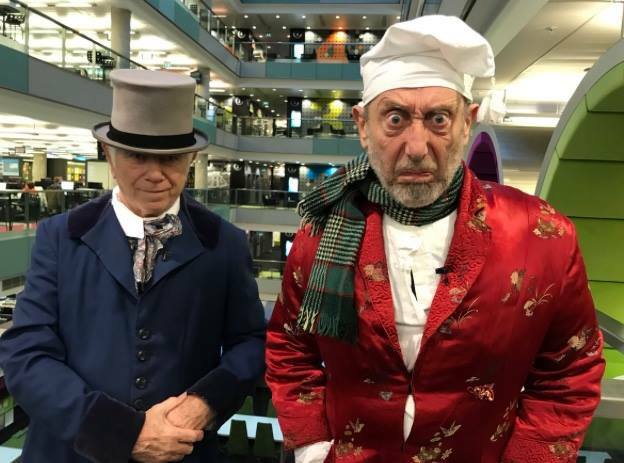 We sat in the studio in our Dickens’ outfits chatting to the presenters and we had finished, Tony said, ‘When do we do the show?’ I said, ‘We’ve just done it, Tony!’ He said, ‘Oh, I thought that was us just rehearsing.’ He didn’t realise that we were on live television and it was all over!!! This time with the Oliver Twist story I’m writing about a… No! I can’t say any more. You’ll have to wait till it comes out next Christmas! On January 18 there’ll be the Lollies Awards. This is the prize for the funniest children’s books of the year. 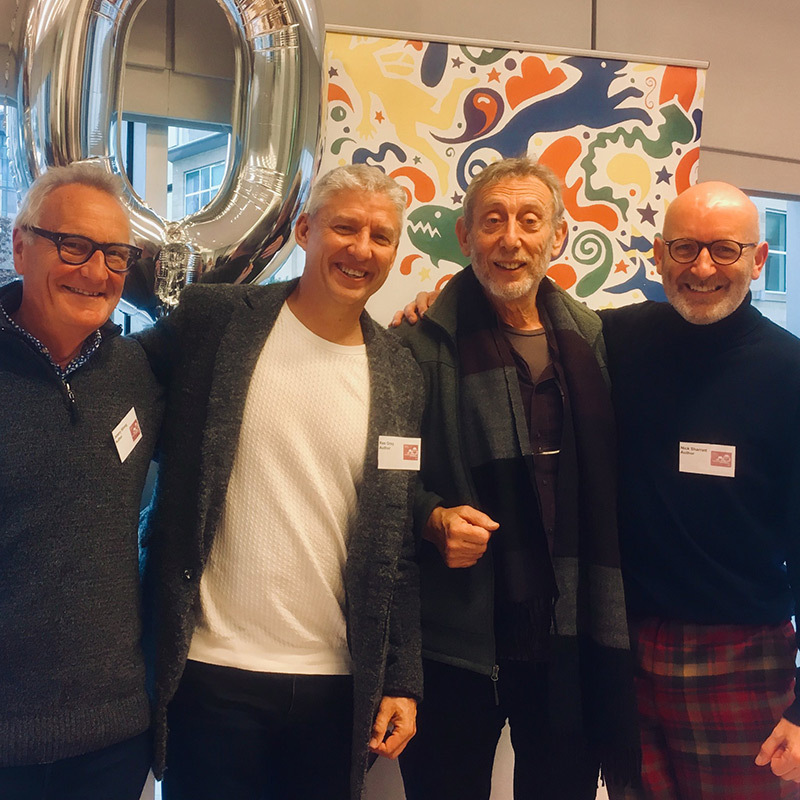 I’m the chair of the judges and each year since I was Children’s Laureate – first with the Roald Dahl Prize and now with the Lollies Awards, we’ve been celebrating funny books. Who is going to win? I don’t know! Children in schools have been voting for the best book and I haven’t seen the results. 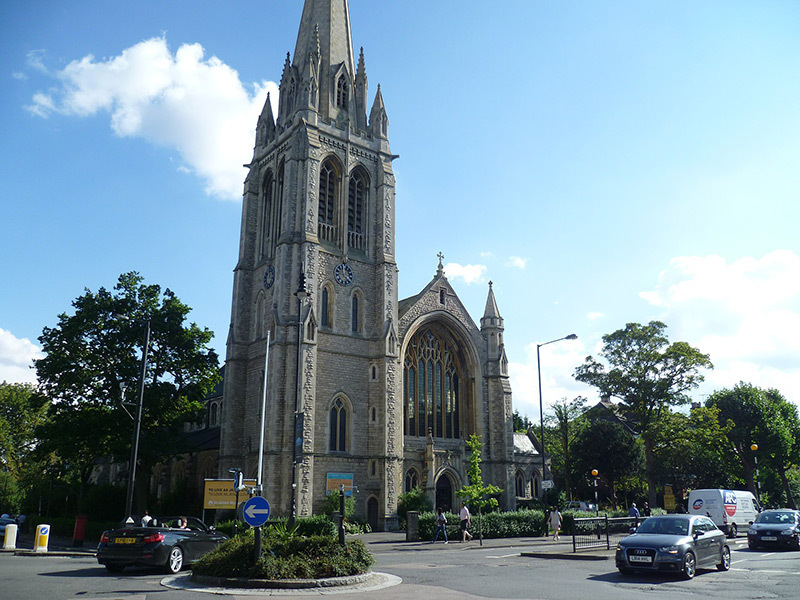 On January 19 I’m going back to my old primary school, Pinner Wood, in Harrow. A couple of years ago, they had to close the school because they discovered ancient chalk mines underneath the school. They thought the school might collapse into the tunnels. Just think, when I was there in the early 1950s, I was playing in the playground and going to lessons and none of us knew that deep down under the school there were these big holes and tunnels…and at any time the school could have fallen down! Anyway, they seem to have filled up all the tunnels (or something!) and I’m going to visit. I’ve been eating a lot of Christmas pudding over the last few weeks. I hope I’m not too heavy!!! 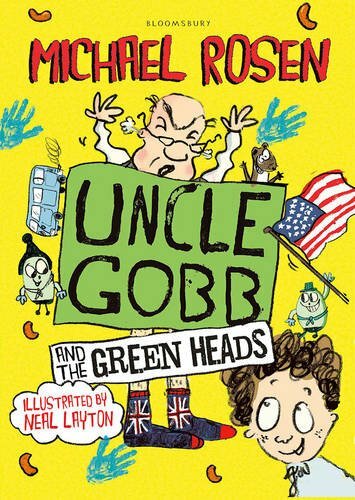 Great news coming up with my Uncle Gobb books: Uncle Gobb and the Green Heads is coming out in paperback soon (January 11th) and my brand new Uncle Gobb book – Uncle Gobb and the Plot Plot is coming out later in the year. More news on that in next month’s News. Teachers: my booklet Poetry and Stories for Primary and Lower Secondary Schools is about ways of reading and writing poems with children. It also has a ‘matrix’ for evaluating how children are responding to poems. It’s available through this site via Amazon or you can get it from Bookmarks Bookshop or Newham Bookshop in east London. The booklet is based on my course at Goldsmiths, University of London, where I teach on the MA in Children’s Literature. One term of this course involves teachers developing projects with their class, encouraging or enabling children to read, write, respond, comprehend literature. We discovered that there weren’t really any full and rigorous descriptions of how children respond to texts, so I’ve devised this ‘matrix’ to help. It links to my book What is Poetry? The Essential Guide to Reading and Writing Poems (Walker) which is intended for both children and teachers. Later in the year, I’ll be bringing out another booklet that is more focused on writing – also based on sessions on our MA course. If you’re interested in doing this MA please go to the Goldsmiths website to see how you can apply. 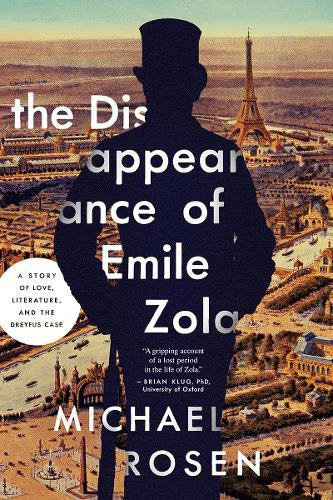 For adults reading this, I can tell you that my book The Disappearance of Emile Zola, Love, Literature and the Dreyfus Case is out in paperback now. My memoir, about me growing up, going to college and discovering the tragic story of my father’s uncle, has been out for a few months: So They Call You Pisher! (Verso). It was great fun doing a live web chat on my YouTube Channel. 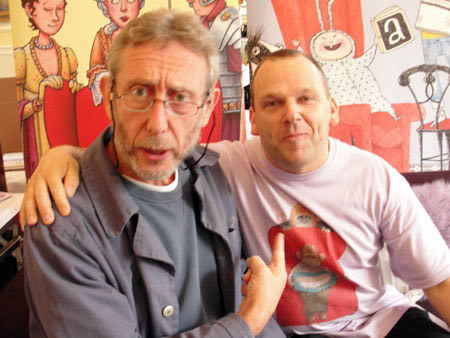 We did this on December 15 and you can see the two halves up on Kids Poems and Stories with Michael Rosen at YouTube. If you’d like to get a shout out or ask me questions on the next one, look out for me mentioning it here or on twitter and Facebook. What I do is chat away for an hour answering your questions and reading out new poems and things. My son Joe Steele Rosen films it on his mobile! Next live web chat – January 17. See you then!!! This Christmas, I brought out Bah! Humbug! with wonderful pictures by Tony Ross. It’s about a boy called Harry who plays the part of Scrooge in the school play of A Christmas Carol by Charles Dickens. He loves doing it. The problem is that Harry’s dad can’t be bothered to stay for the whole show because for him, work comes first….Harry sees Dad leave right in the middle of the show….will he be able to carry on? 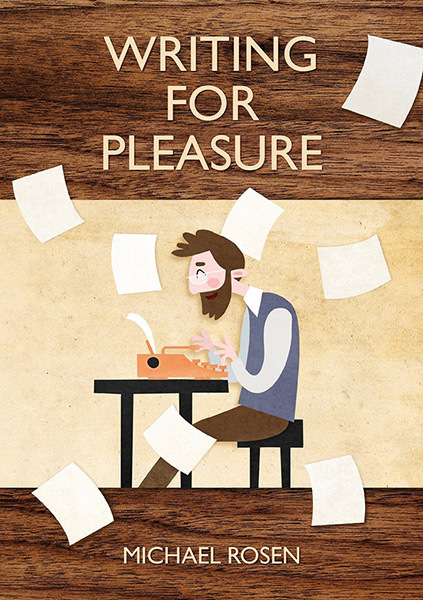 If you’re a teacher and you’re reading this, you might be interested in my little booklet that I’ve written: Poetry and Stories for Primary and Lower Secondary Schools. It’s ideas and thoughts about how to do poetry and stories, why do we do them in schools and what I hope is a useful ‘matrix’ for looking at how children and students talk about poetry and stories. I developed it with my students (most of whom are teachers) at Goldsmiths, University of London. You can get it from Bookmarks Bookshop or Amazon. I’ve been in Cambridge a lot recently helping with their fantastic Historyworks project. This involves thousands of children across Cambridge in discovering history beneath their feet. Cambridge isn’t just the university (which has been there for over 800 years) but all sorts of amazing stuff like exploding fossil dinosaur poo, a Leper colony, Isaac Newton buying glass prisms in the market which as a boy he called ‘prisons’, and stone lions that get up in the might to drink water from the gutter! My job has been to help children write poems about it, while writing some of my own. I’ve been going all over the country talking about memoir So They Call You Pisher! and I’ve even met people who I’ve written about in the book, some of whom I haven’t seen for 40 years or more. One person I met – and this was very moving – was the wife of my English teacher, who I’ve written about in the book. I also got a letter from a man who is 101 years old who I last saw in Germany when I was 11! He’s been writing poems and his autobiography too. An exciting thing coming up is that the Polka Theatre for Children in London is going to put on a play based on my poems. I met up with the director, Peter Glanville, and song-writer, Barb Jungr to discuss what would be in the show. I really have no idea what it’s all going to sound like but I’m very excited by it. I’ll keep you posted. Fun thing happened to me the other day. I went into a little Turkish cafe on the Holloway Road – called Crystal – to pass the time while something else was going on. Soon some families came in and one by one the children recognised me and were soon calling out ‘Noice!’ and ‘Don’t put mustard in the custard!’ and asking me for selfies. Everyone came from different backgrounds, speaking different languages. In the end, the whole cafe was asking me questions, getting selfies while I sat there eating my lamb and aubergine and rice! It felt so friendly and fun and it was everything I like about living in London. 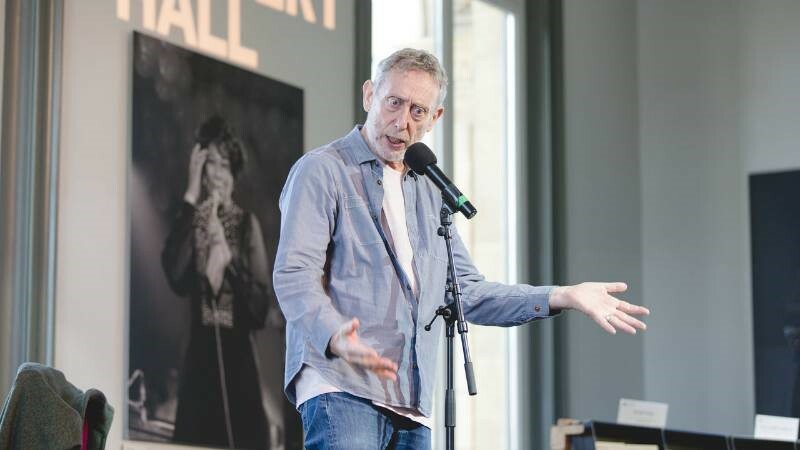 Then I thought if I had known 50 years ago that such a thing would happen to me, that I could sit in a little cafe and people would call out my poems at me and have such fun, I wouldn’t have believed them. I hope you can find your way around it easily. I know that some people who come to the website are looking for answers to questions about who I am, where I was born, where I grew up and that sort of thing. All that’s here! Others are looking for books I’ve written, or places where I’m doing my shows, or maybe just some news of what I’m doing. I hope you’ll find that sort of thing here very easily. 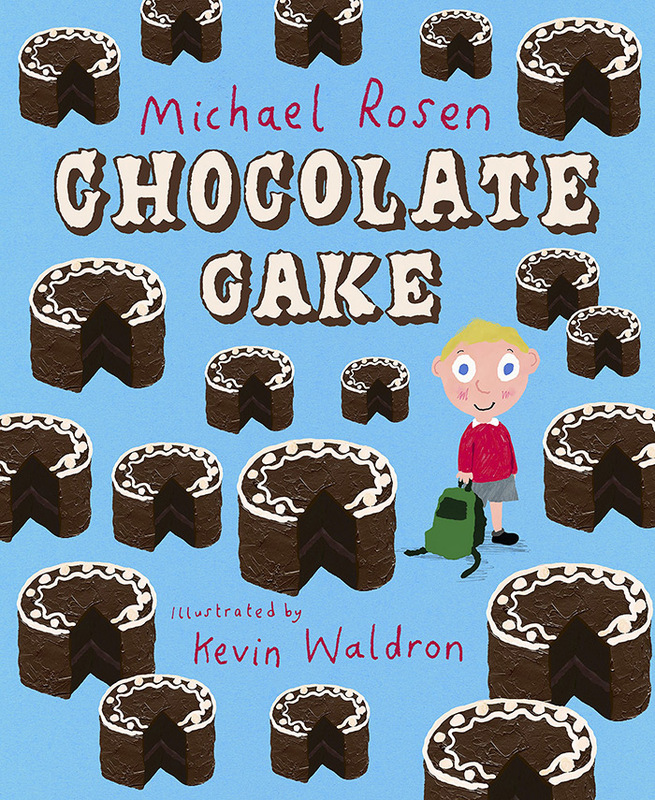 My latest book for children is Chocolate Cake. It’s been beautifully illustrated by Kevin Waldron. If you know my video of Chocolate Cake, then the book has all the words and noises I make on that video. It’s published by Puffin Books. When you read it, you can make all the noises yourself! Talking of ‘Chocolate Cake’, some people who know that video don’t realise that I have a video channel on YouTube where my son, Joe Rosen has put up over 200 of my poems, songs and stories. 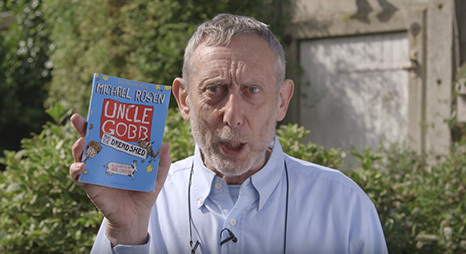 It’s called ‘Kids Poems and Stories with Michael Rosen’. 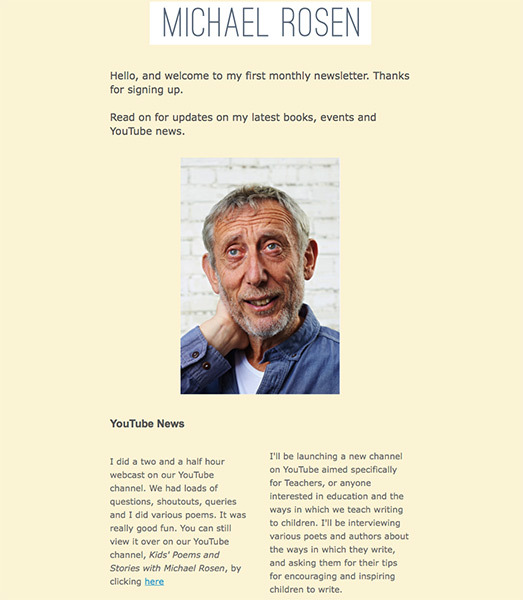 If you subscribe to it, you’ll get a note telling you about new videos that Joe puts on there. I’m also recording radio programmes for BBC Radio 4. 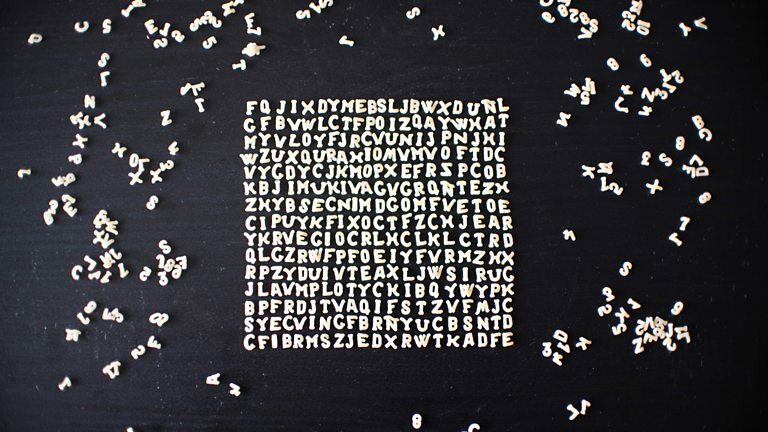 These are mostly ‘Word of Mouth’, the BBC programme about words and language. They go out on Tuesdays at 4.00 and Mondays at 11.00 pm. In one of the programmes, I interview Malorie Blackman, the author of ‘Noughts and Crosses’. After the programmes go out, they all go on to BBC iPlayer. Anyone reading this who does A-level English language would find these programmes very useful. On October 1 at 4.30 on BBC Radio 4, I’m doing a programme about the poet Gerard Manley Hopkins and how he invented a new way of writing. I visited the place where he did this and talk to the poet Michael Symmons Roberts. For anyone studying Hopkins’, I hope this programme will be interesting for everyone but for anyone studying Hopkins, I think it covers some useful stuff! Teachers, if you’re interested in helping make your school one that really focusses on reading for pleasure, then you could come to our conference on reading at Goldsmiths, University of London ‘Reading Revolution’On September 23. I teach at Goldsmiths where I’m a Professor of Children’s Literature. We run an MA on children’s literature, for teachers, librarians, or anyone interested in looking more closely at children’s books, or writing them or illustrating them. We have three ‘pathways’ – critical, creative and illustration. Emma-Louise Williams and I are curating an exhibition of paintings done by the East London Group. It’s on at the Nunnery, Bow Arts in Bow, East London, running from September 29 to December. 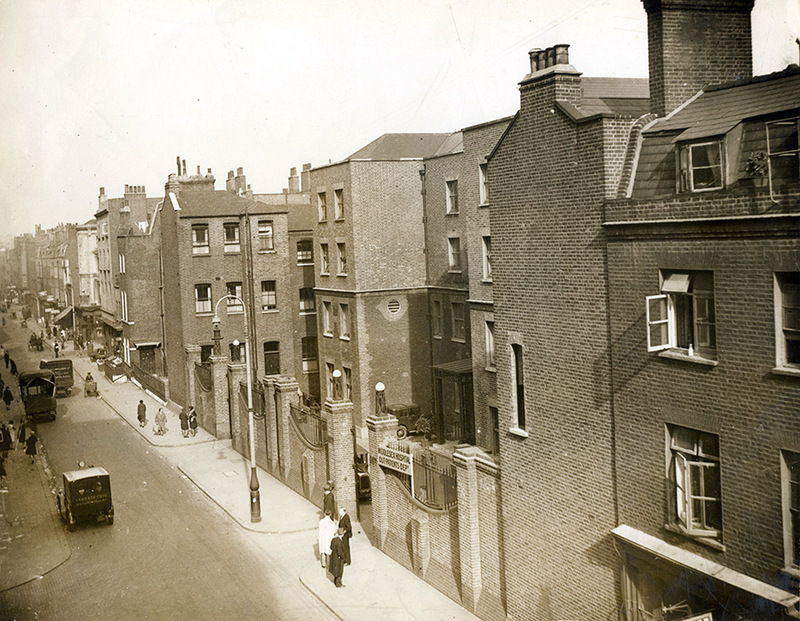 A good deal of the East London Group’s work was focussed on the streets, buildings and parks of East London running from the late 1920s to the 1950s. This is a VR film of Mo from A Great Big Cuddle. On a computer you can scroll around with your mouse. On a phone you can move around using the handset to look around, or you can watch it on a VR headset and have look around. Video directed by Joe Rosen. My son Joe has filmed a further 9 videos of me reading poems from several different books. Here are the last three. I hope you enjoy them. Here are 3 new videos of performances based on my book What’s So Special About Shakespeare?, published by Walker Books. All films directed by Joe Rosen. My son Joe has filmed 12 more videos of me reading poems from several different books. Here are the final three. I hope you enjoy them. All the videos were directed by Joe Rosen. This year I’m really excited to be working with CITV as the Ambassador for their BAFTA winning Share a Story competition which gives children the opportunity to embrace their inner storyteller. Each year Share a Story asks children to enter their stories into our competition with the winning tales brought to life and put on CITV. I’ll be running a scripting workshop with our four lucky winners to help develop their stories. This competition is a fantastic chance to come up with a story and see it turned into an animation. What a treat! Imagine your words, your ideas, your story, on TV as an animated film. Something very, very special. Share a Story is now open to children aged 5-12 until 29th April 2016. To find out more or to enter the competition head over to the CITV website. 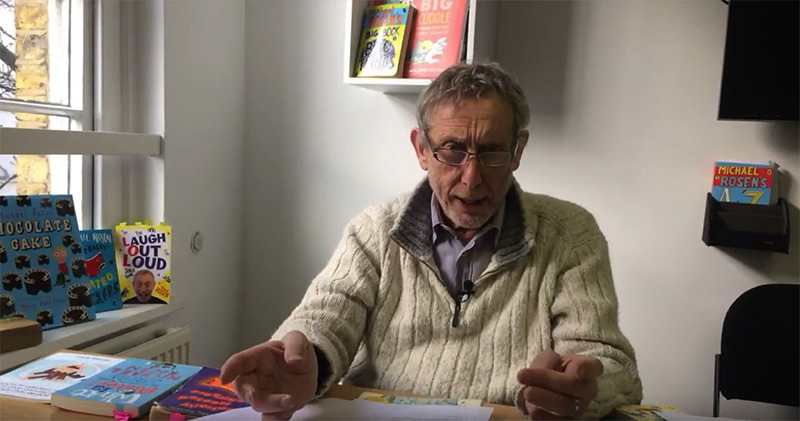 Here are two more videos of me performing poems from my book, ‘A Great Big Cuddle’, with pictures by Chris Riddell, published by Walker Books. All the videos were directed by Joe Rosen. Go behind the scenes and see how they were made. Quite a few people recently have asked me where they can find the words of ‘Chocolate Cake’. As you probably know there is a video of me performing ‘Chocolate Cake’ right here, along with 91 other poems filmed by my son Joe plus some other videos of me in performance from BBC Learning in Scotland and the like. The words of ‘Chocolate Cake’ are in my book of poems: ‘Quick Let’s Get Out of Here’. It’s in print and published by Puffin Books. WARNING: YouTube is a ‘free-for-all’ site. Quite a few people have fun taking my videos and making new versions of them, known as ‘poops’ or ‘YTPs’ Many of these are not suitable for young children. I am not responsible for either the words or pictures of these. If you want to be sure that you’re looking at videos that I made, please only go through this site. Or, if you look closely on YouTube you’ll see the tag ‘artificedesign’ . 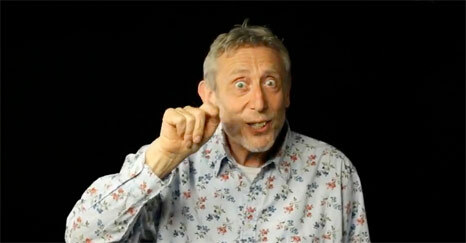 Click on that and you’ll see a ‘room’ of all 92 videos that I filmed specially for this site. The Hypnotiser (out of print) – nearly all the poems from this book are here as videos on this site. Even My Ears are Smiling (Bloomsbury) includes a CD of the book. I am reading quite a few poems at the Poetry Archive. I have just released a new series of videos titled ‘Poems And Stories About My Family’. The poems are all taken from my books and this series of performances was produced by my son Joe. You can watch them now here! Please please please play or download my videos from this site only. These are the only videos officially sanctioned by me as being suitable for children. If you go to YouTube to download or play videos, I can take no responsibility for the material you or the children in your care watch. Please be warned: just because my face and/or voice is on a YouTube page, it does not follow that it has anything to do with me. YouTube is an ‘open’ site, which means that the videos belong to anyone and everyone. Anyone can take them and do what they want with them. 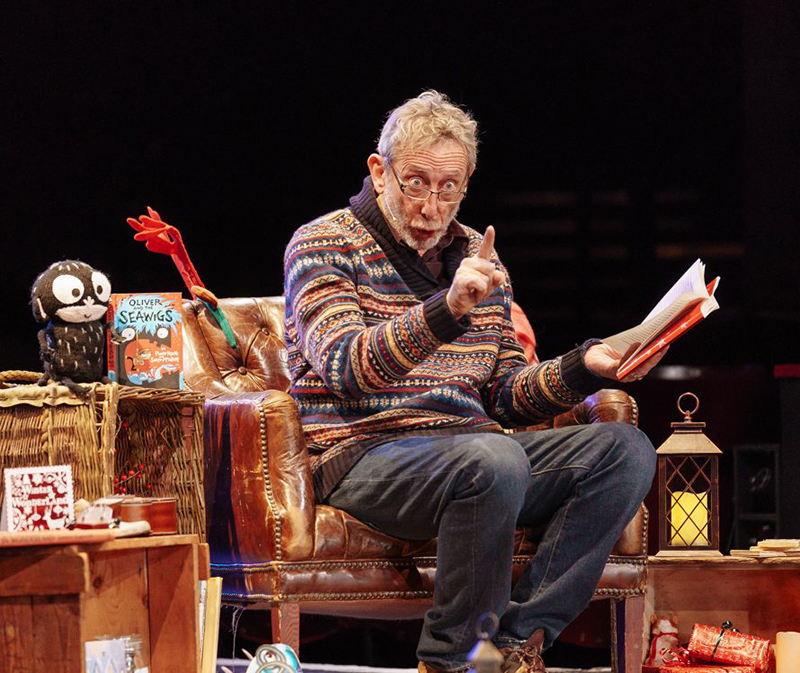 This is an interesting blog on children’s writing, education and poetry by Anthony Wilson. Here’s me taking part in a Guardian podcast with discussion about books. You can watch a video of me performing with the Homemade Orchestra here. I was asked to choose a Champion of the Week for the Guardian – David Crystal – and then several debates broke out. This is an article I wrote about global English for the BBC News Magazine. Government withdraws all funding from free books for children programme, and my response – once in the article and once more in the thread below! Here’s my article on it. 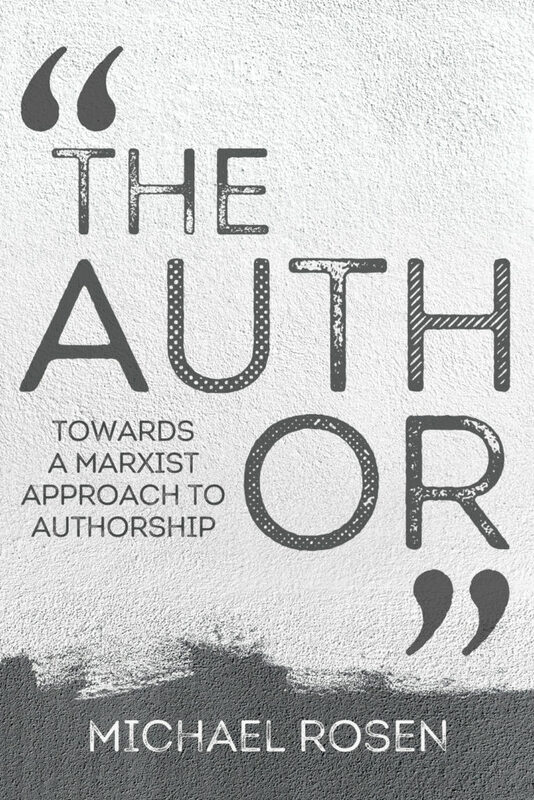 This is an article I wrote for ‘Socialist Review’. 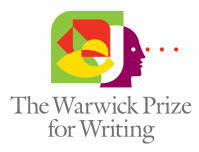 Here is the longlist for the Warwick Prize for writing, which I am co-judging . I’ve helped do some additions to the London Grid for Learning present Perform a Poem. I have chosen a top ten performance films. Please show the children you know and teach. Here is an interview with me in the USA’s Publishers’ Weekly. 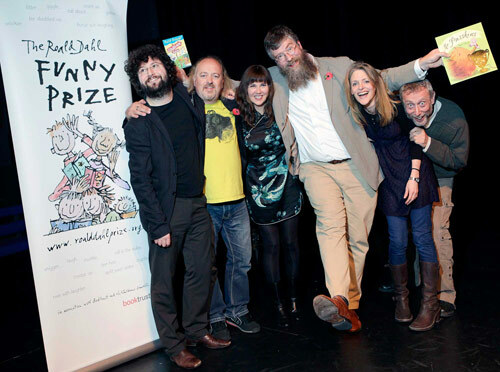 Here is a write-up of this year’s Roald Dahl Funny Prize in Guardian. Here’s my recommended read for the New Statesman. 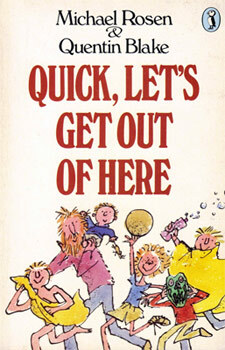 Here’s a teaching suggestion from the British Council with my poem ‘Orange Juice’ from ‘Quick Let’s Get Out of Here’. Here’s a review of my book of ‘Poems for the Very Young’. Some people have been asking me recently, when am I next doing a public performance in London? A great evening happened in Dalston. 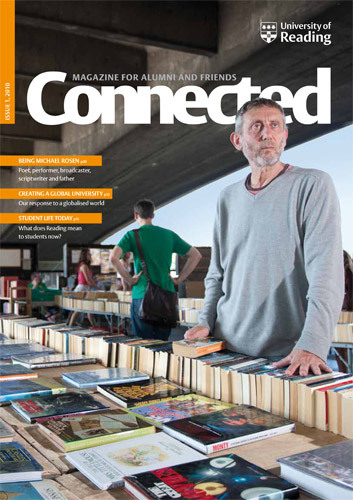 Interview with me in Reading University’s magazine. Here’s me interviewing the wonderful French novelist and champion of books, reading and books in schools, Daniel Pennac. Here’s me trying to save libraries. 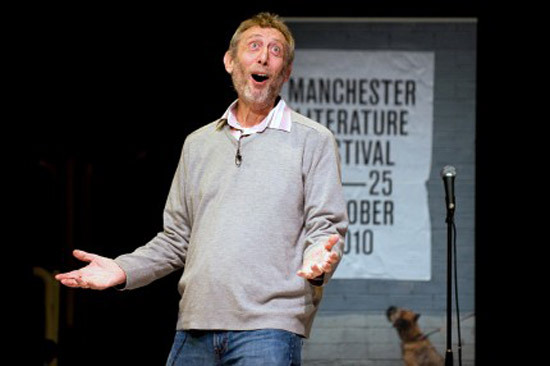 Manchester Literature Festival write-up of me performing. 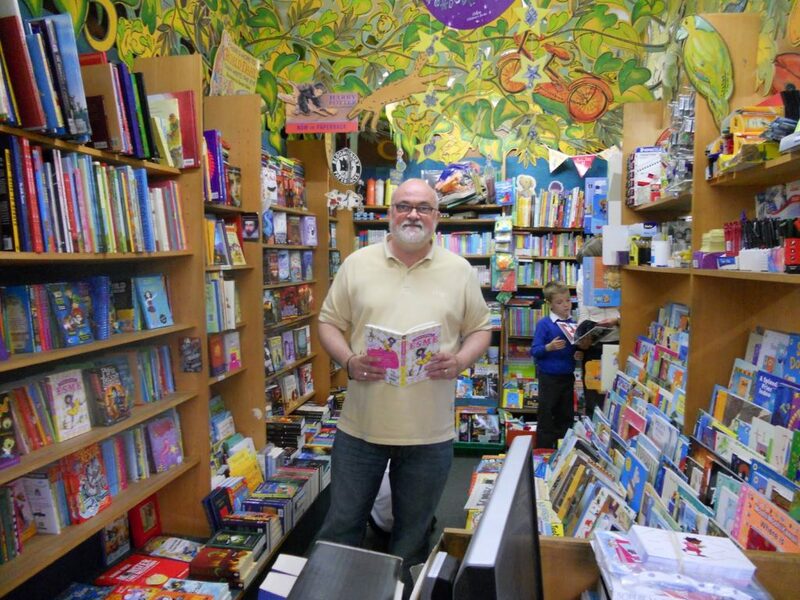 Lovely write-up of the Bath Children’s Literature Festival with a walk-on part for me! 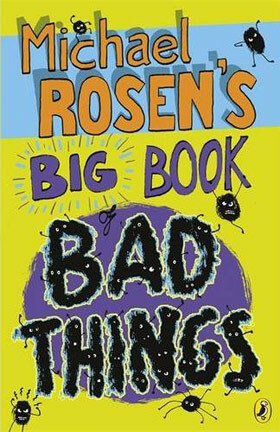 The wonderful children’s books magazine, Books for Keeps has done a feature on me and my new book: ‘Michael Rosen’s Big Book of Bad Things’. Here’s a Guardian newspaper blog thread about spelling, grammar and punctuation that I contributed to. A scandal about Shelley I wrote up for the Guardian at Comment is Free. 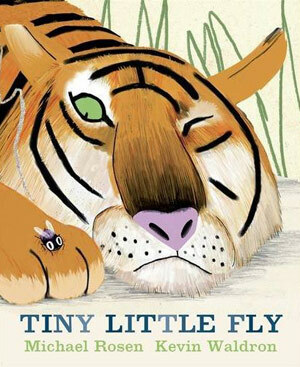 Interview with artist Kevin Waldron re our new book: ‘Tiny Little Fly’ . Here’s a write-up of me working with sixth formers at BSix college in Hackney. 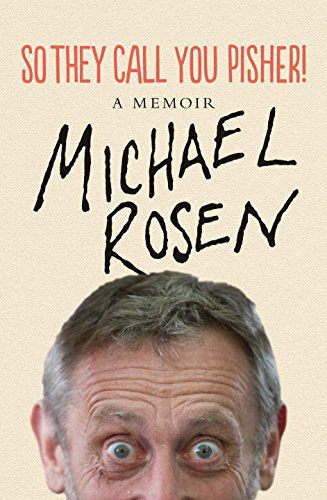 I’ve had some nice online reviews for ‘Michael Rosen’s Big Book of Bad Things’. 2. 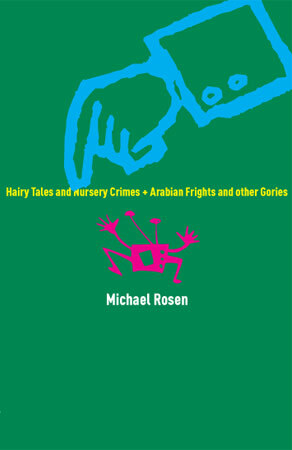 I have republished ‘Hairy Tales and Nursery Crimes’ along with selected stories and poems from ‘Arabian Frights and other Gories’. 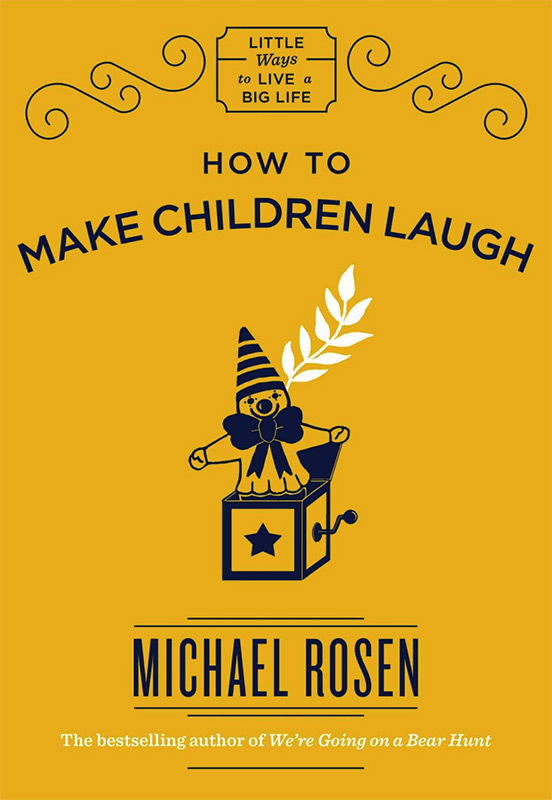 If you’re interested in buying a copy write to me at michael@michaelrosen.co.uk. Here’s a Guardian podcast of me talking about ‘the books that made me’. Here’s what I wrote on a Guardian blog about children’s humour. Here’s a podcast of me and a band called The Dulce Tones, performing a poem I wrote about urban regeneration schemes – called ‘Regeneration Blues’. The Roald Dahl Funny Prize winding up again for 2010. This is an article I wrote for the New Statesman magazine about the revamped Jewish Museum in Camden, London. Here’s a short Guardian article about family holidays. …and here on a visit to a school in Bromley. Short interview at Teach Well Teach Often. 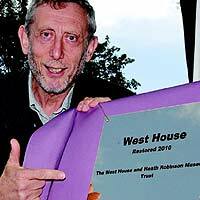 I was asked to give a quick speech to open the restored and updated West House in the Memorial Park in Pinner. I used to walk past this house on the way to school every morning and it was where my mother used to do Scottish Dancing lessons, It’s not re-opening as a gallery space and archive for the artist and cartoonist, William Heath Robinson. Here’s how the local newspapers wrote up the day; Harrow Observer and Harrow Times. 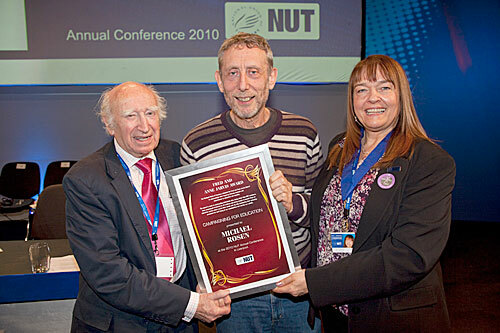 I was awarded the Fred and Anne Jarvis Award by the National Union of Teachers for ‘campaigning for education’. My parents were longstanding members of the NUT, my mother campaigned for equal pay for women, and my father for comprehensive education so it was a proud moment for me to receive this. 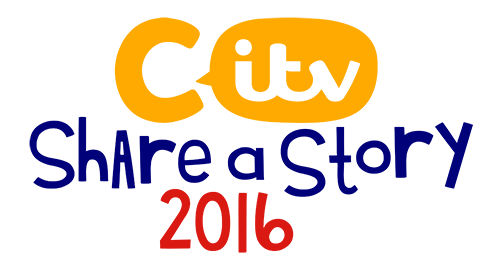 Here’s a great new site called Authors Hotline. This is my page. Here’s an article I wrote for the Independent some time ago about going back to my old secondary school, Watford Grammar School. To browse an index of older news stories, visit the News Archive.